"Come join the fun and enjoy beautiful 360° vineyard views as we take in the sunset with wine and friends on the Doce Robles estate. Centered around the full moon, our “Rising Moon Sunset Series” parties are the perfect way to unwind and relax in the heart of Paso Robles wine country on the beautiful Route 46 West. " A classic Doce Robles experience is, first and foremost, laid-back. With our tucked away country setting overlooking the vineyards, our estate is known for being relaxing and inviting. 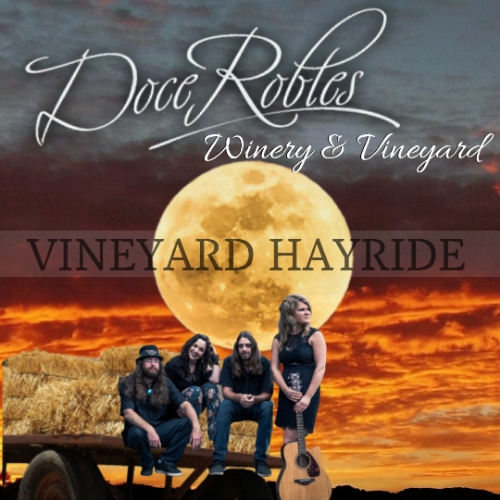 Join us at sunset for the "Sunset Vineyard Hayride" with Doce Robles' winemaker, Jim Jacobsen, and enjoy behind the scene views of our moonlit vineyard. Rising Moon Sunset Series wine events are hosted monthly (May-October), at the time of the full moon, at Doce Robles' Estate Vineyard. May's sunset-full-moon party lands on Paso Robles Wine Festival Weekend and features a "Blue Moon," a rare lunar calendar event. We will be pouring plenty of wine, so invite your friends and family to celebrate Paso Robles, CA's beautiful vineyards and delicious wines! Doors open at 6 pm. General admission includes your choice glass of Doce Robles' wine. Additional wines and local catered dinner available for purchase. Live performance by award-winning Noach Tangeras, an American roots band with rock, folk, country, and blues emphasis. At the evening's end (weather permitting), we showcase a warming fire for toasting s'mores under the full moon. Don't forget your jacket!